Get ready. I am about to tell you about a book that you will want to savor in small pieces because it is so so good. 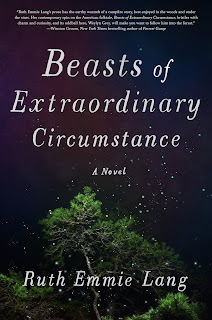 Beasts of Extraordinary Circumstance by Ruth Emmie Lang is the book you need in your life right now. Lately, more of my friends are looking for books they can escape into. Books that offer respite from the issues we are facing today. And, books like Beasts of Extraordinary Circumstance give us a world we can disappear into between the pages. This is a fictional novel with some doses of magical realism with characters you will not soon forget. The premise sounds crazy, but please hear me out. The author makes it work. Basically, this is a story about a boy who grew up with wolves after his human parents died. Upon being discovered, he is sent to a foster home where his unique and magical qualities turn the family upside down. But, his journey doesn’t stop there. The story centers around this character (Weylyn) and all the people his gifts (such as controlling the weather and making things grow) impact over the years. Readers are introduced to the various people who have been flummoxed by his special abilities, as well as those who love him completely for all that he is. If you saw the movie Powder, it reminded me of it. I know it sounds bizarre – as I was explaining it to my husband I realized it did not sound like the normal stuff I read. But, it was beautiful and moving and hopeful – and the perfect antidote for a time when the world seems to be in a great state of upheaval. We all need some magic and you might find it in a character like Weylyn. I just need you all to trust me on this one – Beasts of Extraordinary Circumstance is a book you need to read. It comes out on November 7th and people are going to be talking about this one for a while. *I received this book free from NetGalley in exchange for an honest review. *You can pre-order this book on Amazon here or by clicking the picture.